Integrated vapor phase activated carbon adsorption systems can come in a few basic forms and are oftentimes the answer to remediation and industrial processing problems. It is crucial that the entire integrated system be carefully assembled with the right vapor phase adsorption vessels; the optimal media for removal of contaminants from vapor emissions; pressure blower systems capable of generating proper flow rates and interconnecting pipe racks and flex-hose ductwork when needed. TIGG technical representatives and engineers have years of experience putting together standard or custom-designed vapor phase adsorption vessel systems to treat vapor streams up to 20,000 CFM flow rates. When clients require a standard solution, they get the right system delivered quickly thanks to TIGG’s large in-stock inventory of standard equipment that is available for sale or ready to rent. Integrated vapor phase systems can include adsorption vessels, blowers, ductwork, output stacks and electronic control panels. In addition to vapor phase activated carbon adsorption vessels, large-scale integrated systems are comprised of pre-engineered blower systems with panel filters that can individually handle flow rates up to 20,000 CFM. And, these blower systems can be combined to manage even higher flow rates. When required, sturdy flex-hose ductwork or rubber-lined galvanized steel hoses connect the blower systems to the adsorption vessels. In some cases, such as the one pictured above, a steel pipe rack interconnects the vessels. Additionally, TIGG’s NIXTOX box adsorbers can include output stacks to direct the flow of the polished effluent. Also, electronic control panels that operate starter motors can be part of the overall vapor phase adsorption integrated system. 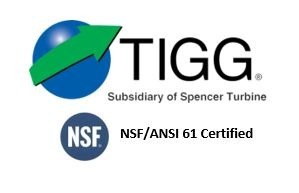 TIGG’s vapor phase activated carbon adsorbers are designed for use with: air stripper off-gas, SVE, tank vents, contaminated air resulting from remediation of contaminated soil, odor control, manufactured gas plant (MGP) contaminated vapor generated during remediation, process vents and fumigation of residual gasses. Not only does TIGG provide larger NIXTOX modular activated carbon box adsorbers, we also offer smaller systems with blower packs for use in vapor phase applications with low flow requirements. These self-contained units can be used for emission control to remove organic vapors.